Wendy off the rock... : The ultimate grudge match: Friday 13th meets Valentines Day. 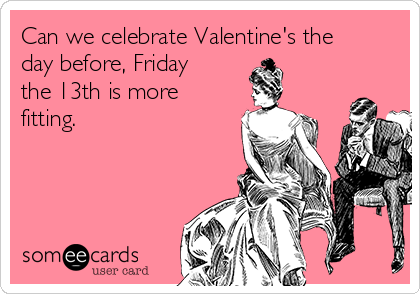 The ultimate grudge match: Friday 13th meets Valentines Day. Tonight is surely the perfect time for every confidence-sucking ego-driven narcissist to sharpen their claws and polish their fangs in preparation for their ideal hollyday. No. That’s not a typo or a spelling error. It’s a portmanteau word of which I’m sure Lewis Carroll, maybe even The Bard himself, would have approved. hollyday n. a festive or celebration day cultivated and sustained by movies made in Hollywood, often with a commercial or fiscal motivation; a day on which people are supposed to act in a predetermined manner that usually involves buying something, acting the fool, or inadvertently making others feel like crap. This 21st century coinage was created by the fusion of two distinct morphemes: holly is derived from Hollywood; day, as in a period of 24 hours, is both a complete word and a lexical reference to holiday by virtue of both its visible and audible connections. I hate Valentines Day. Not because I’m a bitter lonely old loon, although that is probably part of it, but mostly because I don’t see the point of Valentines Day. Except maybe that it means florists can up their prices and restaurants can anticipate bums on seats. I don’t understand how a Roman priest who was purportedly beaten to death with sticks and then beheaded one lovely February 14 by Claudius II and his cronies for marrying couples when that was a major no-no represents romance and roses and chocolates. He wasn’t marrying them because they couldn’t be together any other way, either. Living together was all cool with Claudius. Hell, even polygamy was smiled upon. Claudius just had a thing about marriage. A slightly different thing from the thing the Christian church had about marriage. Hey, they voted this Valentinus dude the patron saint of beekeepers and epilepsy for God’s sake (pun intended). How romantic is that? And I’m almost certain the guy didn’t get himself martyred so that people could spend a day feeling like crap because nobody is expressing love to them. Not even with a rose made out of that yukky fatty-tasting chocolate or a super-cheesy anonymous card. And I’m fairly confident in saying that he wouldn’t have been thrilled to be associated with smug self-satisfied beeatches who flaunt their love-heart necklaces and count the petals on their bouquets as if those things prove they’re more worthy of love than others. I’m pretty sure that’s not what he died for. So, happy hollyday to you all. I hope the ghosts of Friday 13th protect you from having your head beaten with sticks. Except if you’re one of those sharp-clawed polished-teeth beeatches who makes other people feel bad. If you’re one of those, I hope you’re love heart gets caught in your zipper. I do love those cinnamon hearts you can buy during this holyday though! My original comment seems to have vanished into the black hole! Anyway, I hate those smug types as well that think that how much you are loved is measured on how much your partner spends on you (or is ripped off)!